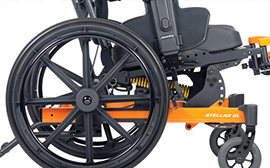 Designed to provide pressure relief, improved positioning, and independence, the Stellar GL is a manual tilt-in-space wheelchair designed to offer up to 45° of tilt while maintaining low occupant knee rise. This permits it to be to be maneuvered under tables, even while in tilt. The Stellar GL allows its occupants to be placed in the most beneficial seating position while allowing them to be more involved in their daily life activities. Simple adjustment requiring only four bolts to the adjust seat height. 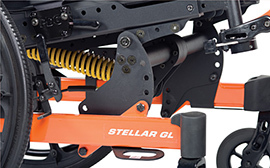 Allows fine adjustment of the chair’s centre of gravity to allow for more stability and comfort. 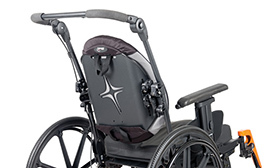 Adjustable uplift force to balance the weight of the occupant in the chair, which allows for easy tilt. 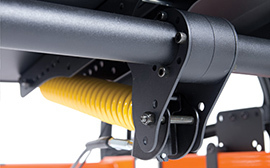 Easy adjustable push bar allows for attendants to set capabilities.